A Mass of Christian Burial for Dan McKinnon of Warroad, MN will be held on Saturday, August 12th at 10:30 AM at St. Mary's Catholic Church in Warroad. A visitation will be on Friday evening from 5-7 PM with a 7:00 prayer service AT THE CHURCH. Private interment will be held at a later date. Military honors by the Warroad American Legion/V.F.W. Daniel Duncan McKinnon was born on April 21, 1927 to Ida Mae (McIntyre) and Paul McKinnon in Williams, MN. Dan was raised on his family’s farm south of Williams along with 8 brothers and sisters. In 1945 Dan enlisted in the United States Navy and was called up in WWII where he served in Guam. On August 1, 1946 Dan was honorably discharged; this was a date he always remembered and commemorated for 71 years. Soon after his return to northern Minnesota, Dan went to the University of North Dakota where he co-founded the first UND Fighting Sioux hockey team. He played defense on the team that would upset national powerhouse Michigan 6-5 in 1948 and put UND in the national spotlight. Dan was one of UND’s first All-American hockey players in 1949-50 and was inducted into the UND Athletic Hall of Fame in 1982. Dan continued to play semi-pro hockey in San Bernardino, California and in 1955 played for the US National Team at the World Hockey Championship in West Germany. In 1956, Dan was Captain of the United States Olympic hockey team in Cortina, Italy, where they won a Silver Medal. He continued his hockey career and in 1958 Dan played for the US National Team at the World Hockey Championship in Oslo, Norway. His love of hockey provided him the opportunity to travel the world and develop lifelong friendships. Those experiences translated into stories that would be shared for the next 60+ years always bringing joy and laughter. 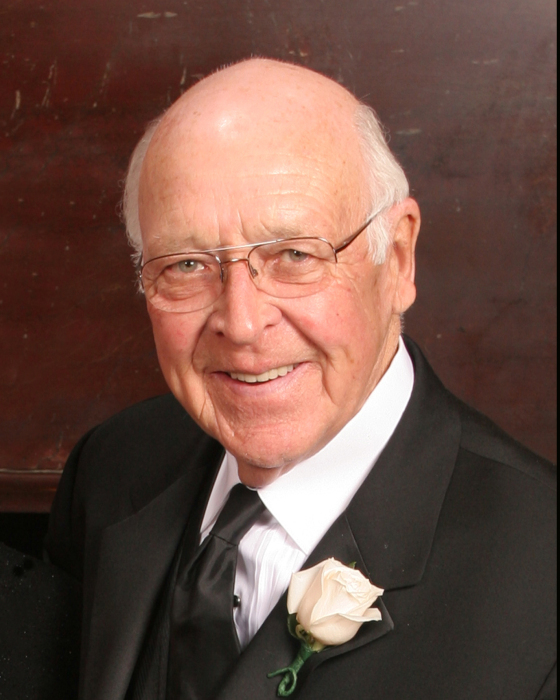 In 1954 Dan began working at the Marvin Lumber and Cedar Co. as a sales representative. Dan’s professional career carried him across the state of Minnesota and North Dakota where more lifelong friendships were made. Dan’s customers became some of his closest friends. He was a consummate professional and vastly loyal to the Marvin family working for 38 years in the lumber, window and door industry. Dan married the love of his life, Elouise Marchuk, on April 22, 1966 and started their family with sons Tim and Robert in Warroad, MN. In 1968 they purchased their riverfront home where loved ones, friends and family have gathered for holidays, special occasions and weekday evenings on the deck ever since. While a career hockey player, Dan’s true passion was baseball and he enjoyed playing on the Warroad Muskie baseball team. Dan was also an active member (former Commander and Chaplin) of the Warroad American Legion and an active member/leader at St. Mary’s Catholic Church. Dan is survived by wife Elouise, children Tim (Lori) of Warroad, MN, Kellie (Robert) Caddick of Baltimore, MD; four grandchildren, Jessamyn, Kala (Matt), Jordan, and Aaron James; two great grandchildren Brian and Johanna Joy; and sister Peggy (Gerald) of Roosevelt, MN. He is also survived by loved ones Sherri Salo of Port Orchard, WA; Lee (Leva) Marvin, Alisha (Tom) Dostal, Brittany (Bryan) McGregor, Briana (Josh) Brodeen of Warroad, MN; Nick and Michael Caddick of Baltimore, MD and best friend Neil Richards of Warroad, MN. Dan is preceded in death by his parents, brothers William, Gordon, Paul, John and Malcolm; sisters Florence and Mae; and son Robert. The McKinnon family wishes to note that Dan lived a happy and full life for 90 years, may God’s eternal light shine upon him. Memorials are preferred to the Warroad Veterans Memorial Park and HELPP of Warroad, MN.